Pre-Register: By mail or stop in the Boys and Girls Club by March 1st to guarantee a race shirt. Please come out and join us for a fantastic family fun Run/Walk to support the Boys & Girls Club of Janesville The 5k will be timed, however it is a fun laid back event. We encourage runners to dress up in their best Irish outfits. 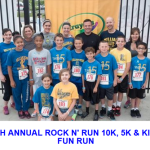 It’s all about raising funds for our youth programs.Participants can sign up for a 5k run or a 1 mile walk. The 5k will be timed, however it is a fun laid back event. We encourage runners to dress up in their best Irish outfits. It’s all about raising funds for our youth programs.